One of the most advantageous aspects of digital SLRs – interchangeable lenses – can also be an annoyance to photographers. Because the inner chamber is exposed when lenses are removed, foreign elements and dust can easily enter and settle on the working parts, such as the sensor.  Because of this, regular cleaning is a necessity if one is interested in blemish-free pictures. The cleaning procedures generally fall into two camps – dry cleaning to remove dust and particles, and wet cleaning involving chemicals for stubborn spots. 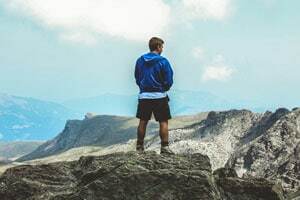 This article will serve a twofold purpose – to look at the process of dry sensor cleaning, and also to review a sensor brush product from VisibleDust – the Arctic Butterfly 724. Dust particles on the sensor doesn’t usually mean the end of the world – they usually show up the most when a small aperture is used, and where an image has large areas of uniform colour.  Blue skies are a common example, and the 50% crop below evidently shows multiple splotches and out of focus blobs – clear indication of dust on the camera’s sensor. A blower tool – used to literally blow particles out of the chamber. This is definitely the first and preferred method, as you reduce the chance of introducing oils and smears through contact methods. With delicate parts such as the sensor, I strongly recommend against blowing using your mouth, or “misting” it up using your breath, as you might inadvertently put oils, spit and other nasties onto the surface. A dry sensor cleaning tool, such as the Arctic Butterfly 724 sensor brush, which can lightly remove particles that can’t be dislodged by the blower. A wet sensor cleaning kit, to get rid of stubborn spots, smears and oils. Because these usually involve applying chemicals to the sensor surface, I try to do this only when absolutely necessary. Depending on your confidence levels as well, you might want to omit this step, or leave it to your camera service professionals to perform. I should also note that though I use the word “sensor” very liberally in this article, digital SLRs have a filter or protective plate over the actual sensor. I would still treat this surface very delicately though, lest you leave any permanent marks or scratches. 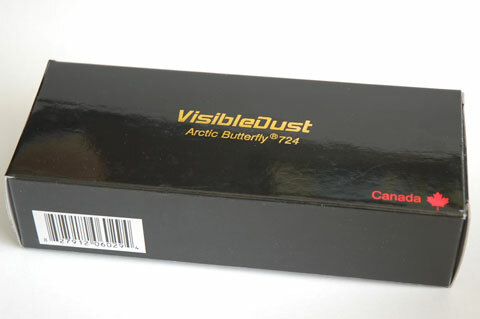 Let’s take a quick look at the Arctic Butterfly 724 sensor brush from VisibleDust, which is a Canadian company which specializes in cleaning products for delicate parts such as digital SLR sensors. I have heard of people using artists brushes, which are definitely cheaper and more readily available; however, some contain chemical stiffeners that might scratch delicate surfaces. The Arctic Butterfly arrives packaged in a swish black cardboard box, which opens to reveal a nice faux-leather travel case. This case has a carabiner for attachment to your luggage, as well as a zip which opens to reveal a rather nice looking, sturdy green plastic case. 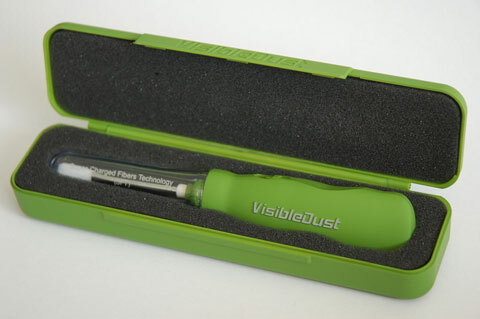 The hardcase is foam padded, moulded perfectly to fit the green sensor brush inside. Pick up the Arctic Butterfly 724 and you’ll notice that the most important bit – the brush head – is cleverly protected by a removable, transparent plastic cap. The brush head is detachable for cleaning by giving it a firm tug, which might also indicate that it can be replaced. 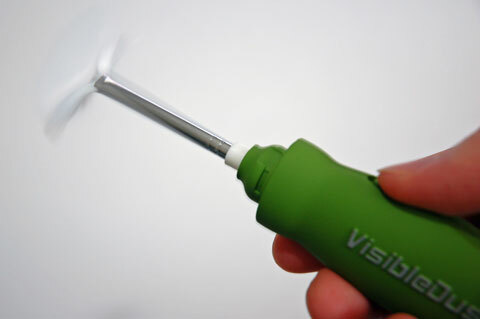 The green handle is constructed of a nice matte plastic, with the company name very stylishly embossed on the front. The side of the brush sports an on/off slide switch, and the back of the brush slides open to reveal a compartment for 2 AAA batteries (not included, unfortunately). Now you’re probably wondering why a sensor brush would need batteries. One problem with traditional cleaning brushes is that sweeping dust simply slides the dust around, and there is a possibility of leaving some behind. Some brushes overcome this by “charging” the bristles with static electricity prior to use, to allow them to literally attract and pick up dust particles. This usually requires the use of compressed air or special paper. The Arctic Butterfly 724 achieves this effect through spinning the bristles at high speed using a built-in motor. As an added benefit, spinning the bristles also dislodges any residual dust trapped in the bristles. Do this 3 times for 5 seconds, and you’re ready to go. 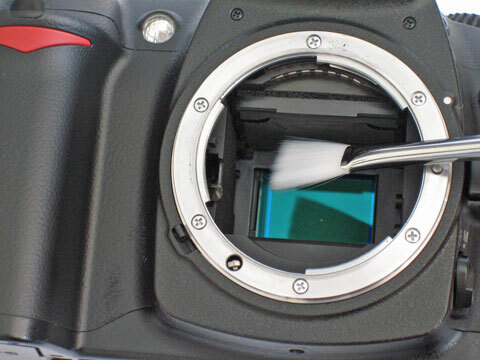 To clean your digital SLR sensor, you’ll need to put it into a mirror-lock up mode to allow access to the sensor behind. Consult your camera manual how to do this, then remove then lens to expose the chamber, if you haven’t already done so. Cleaning the sensor surface is simple – gently wipe the brush from one side to the other. Repeat if necessary for stubborn particles, but do so in the same direction only. Cleaning the Sensor - note the huge dust particle! Other things to watch out for are pretty much common sense – avoid touching the brush bristles with your fingers unless you want oil smears on your sensor. Keep the sensor brush dedicated to cleaning sensors only; I keep a separate brush for chamber cleaning, and brushing dirt off lenses and filters. Finally, they recommend cleaning the brush head every few cleanings with pure Isopropyl Alcohol, pure Ethanol, or their Sensor Brush Wash product. After dry cleaning, the sensor should be spotless, as evidenced by the blemish-free photo below. Digital SLR sensor cleaning is a straightforward activity which should be done regularly, to ensure clean, pleasing photos without unwanted blobs. Products such as the Arctic Butterfly 724 from VisibleDust make this process very much pain-free, with good results too. I found that it worked as advertised, with no problems picking up dust and leaving the my sensor spot-free. The spinning mechanism is a very novel way of self-cleaning and charging up the bristles, without having to resort to compressed air. As a result, it is very quick to use and put away, with minimum fuss and mess. I was very impressed too by the sturdiness and quality of the construction, and the hardy protective cases supplied. There aren’t many negatives to point out – the most apparent would be the high price of the unit. Surveying the market, rival sensor brushes are retailing as low as a quarter of the price for a basic brush, or even in one case, a complete wet and dry cleaning kit for the equivalent money. This can be justified though, in that you are paying a premium for the patented spinning system, and one doesn’t need to carry cans of compressed air, making it very travel friendly. There is also a slightly more affordable model, the SL-700, that spins at a slower speed. Finally, I need to point out that the instructions are literally printed on a piece of copy paper, folded and stuck inside the box. While the instructions are clear, it would have been nice to see a more professional looking pamphlet, or at least something glossy with diagrams, considering the price one pays for the product. All in all though, I was very pleased with the Arctic Butterfly 724 sensor brush from VisibleDust, and would definitely recommend it to others. 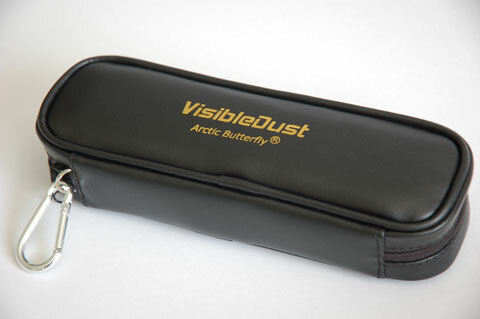 The Arctic Butterfly sensor brush from VisibleDust retails for CAN$104.95 (USD$75 or AUD$122), and can be purchased directly from the VisibleDust website. Support Shuttertalk by purchasing the Arctic Butterfly 724 on Amazon with free shipping!